Historic Philadelphia Tour: Betsy Ross House. 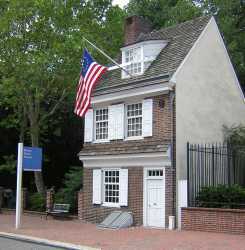 If you're visiting Philadelphia, stopping in at the Betsy Ross House is considered almost mandatory. It's one of the most visited historic sites in Philadelphia. Facilities: Tour (self-guided), audio tour available ($7 including admission), gift shop, and restrooms.